to the 95 attendees for their enthusiastic and informative contributions. A fuller report appears in our members' newsletter (Join here). D3 In The Lab: Genetic contributions to Molar Hypomin vulnerability? Following June's feature linking subtle genetic variations ("polymorphisms") with dental fluorosis, we highlight a similar study addressing Molar Hypomin (MH) and its hypothesised links to inflammatory childhood illnesses. A Brazilian group including D3G member Rita Cordeiro surveyed 11 genetic markers for inflammation and found that one (TGF-beta) correlated significantly with severe cases only. While not suggesting direct causation, this work supports recent thoughts that subtle genetic variations contribute to MH vulnerability (see abstract here). A fuller report appears in our members' newsletter (Join here). Building on their previous research into other enamel defects, researchers at the University of Sheffield (led by D3G member Helen Rodd) have now undertaken a ground-breaking prospective study about psychosocial impacts of Molar Hypomin. The child's opinion about his/her "quality of life" was established before and after cosmetic treatment of their hypomineralised front teeth. The findings showed a strong improvement in quality of life across 93 subjects, establishing that relatively straight-forward interventions (microabrasion, resin infiltration, bleaching) can provide major benefits to susceptible kids (read more here). A fuller report appears in our members' newsletter. A shock finding from a survey of paediatric dentists in the US Midwest was that nearly half use amalgam to restore hypomineralised 6-year molars (MH). D3G member Azza Tagelsir found that nearly all respondents were aware of MH and 85% regarded it a significant clinical problem. Diagnostic confidence was high yet 44% erroneously linked this condition to excessive fluoride. Except for amalgam, these findings mirror those from similar surveys done elsewhere around the world (see abstract here). A fuller report appears in our members' newsletter. D3-awareness appears to be growing amongst "oral health professionals", by which we mean the dental therapists, dental hygienists and oral health therapists who play a major frontline job dealing with Molar Hypomin. Thanks to ongoing support from the leadership of ADOHTA and DHAA, update articles about D3G and the Chalky Teeth Campaign were published in their respective members' newsletters recently. Judging by ensuing orders for Sam storybooks, D3G referral cards and memberships, these articles "hit the spot" – consequently we plan to co-opt other D3G associates to extend such awareness-raising across the D3 family. Before the aforementioned webinar, Colgate America polled registrants by asking "How familiar are you with the condition Molar Hypomineralization?" Of 542 replies, only 18% said "very", 46% said "somewhat", and a whopping 36% said "not at all". We are hopeful this depressing picture has since improved because the webinar attracted 1,700 live views (an all-time record says Colgate) and another 1,200 views in the following month. Although watched around the world, 80% of live views came from the US – explaining why USA topped D3G's website traffic in November, leaping past usual leaders Australia and New Zealand. We were thrilled by Colgate America's invitation to present a webinar about "the Molar Hypomineralisation problem" and our Chalky Teeth Campaign. D3G-NZ rep Erin Mahoney provided an elegant summary of clinical aspects sandwiched between Mike Hubbard's latest translational take on MH definitions, terminology and social impact. Our thanks go to Barbara Shearer and her team at Colgate America for making this wonderful opportunity possible and the allied donation. Watch the free webinar here. An invitation from the Australian Dental Association's Group H to update their study group about "the Molar Hypomin problem" and D3G's Chalky Teeth Campaign was met with a well-attended lecture by Mike Hubbard. Our thanks to the organisers for this opportunity and their generous donation, and to the participants for the interest shown. D3G was represented by Mike Hubbard at the back-to-back meetings of paediatric dental organisations AAPD and ANZSPD-NSW in Sydney. We thank both groups for hosting D3G gratis, and a special thanks to AAPD for sponsoring copies of our new "chalky molar" edition of "Sam's storybook" for all delegates. D3G-NZ rep Dorothy Boyd and Mike Hubbard were interviewed on Radio New Zealand about Molar Hypomin. Although we have some reservations about this topic being headlined as "a distressing dental condition", we are grateful for the massive public exposure achieved. The interview can be replayed here. Extending from earlier discussions (see News), the Australian Dental Association's NSW branch generously sponsored a copy of "Sam's storybook" (the new "Chalky Molar" edition, see News) to all 300 delegates at their annual convention in Canberra. Our thanks to Abby Corrigal and her team for making this wonderful advance happen. We're pleased to introduce Bernadette Drummond as D3G ambassador for the United Kingdom, joining Vidal Perez (Latin America) and Rami Farah (Middle East) [see News & News]. Now Professor and Honorary Consultant in Paediatric Dentistry at the University of Leeds, Bernadette was influential in D3G's genesis having discussed medico-dental research needs with Mike Hubbard over many years. Bernadette subsequently supervised several postgraduate studies into Molar Hypomin (including Rami's) and helped conceive our PRACTITIONER pages. She has enjoyed a career-long interest in enamel defects seeking to extend compatriot Grace Suckling's wonderful legacy in this blossoming field. A fuller report appears in our members' newsletter. Featured article: Extra time allocation for Molar Hypomin cases? Most practitioners agree that Molar Hypomin (MH) cases can soak up lots of extra time, effort and patience – but they're also likely to say it's hard to quantify this given numerous variables involved. A Nigerian study led by D3G member Morenike Folayan has broken the ice by timing various clinical activities (history taking, diagnosis, treatments) in MH cases of varying severity. Some but not all procedures were significantly lengthened by MH leading to almost twice as many visits overall (see abstract here). A fuller report appears in our members' newsletter. An exciting milestone for our new 'We Fight Chalky Teeth' specialists initiative has been reached with the 10th member practice now getting its "website makeover". It's pleasing to have both orthodontic and pedodontic practices on board and to see that the "three-way benefits" (for clients, practice and D3G) are working as hoped. Further pioneers are sought to help develop this ground-breaking venture, which has exciting potential to support major contributions to research, education and society. Our first "translational" article about D3G and the Molar Hypomin problem has reached a major milestone having attracted 5,000 views since it was published in a highly ranked scientific journal a year ago. This and other statistics, including our expanding army of researchers interested in D3s, confirm we're doing well "getting the D3 word out". Moreover, by introducing "chalky molars" to the academic literature after successful road-testing on the public and practitioners, this article provides a rare example of "reverse translation" – most talk today is about the other direction (getting science out to the public), but clearly both matter. D3G members Yana Istkovich and Mike Hubbard attended the Australian Orthodontic Society's Victorian branch meeting in Melbourne to provide an update on recent happenings with D3G and the Chalky Teeth Campaign. We are grateful for the interest shown and look forward to further interactions with ASO. D3G is honoured to have received endorsement from the NZ Dental Hygienist's Association. Together with earlier such recognition from the NZ Dental and Oral Health Therapists Association, we now have comprehensive links with the all-important "oral health practitioners" subsector in New Zealand. We look forward to collaborating with both NZ organisations and their Australian counterparts (ADOHTA, DHAA) to improve D3 awareness and management "down under". Extending from earlier discussions (News), the Australian Dental Association's Victoria branch generously sponsored a copy of "Sam's storybook" (the new "Chalky Molar" edition, see News) to all 600 delegates at their annual convention in Melbourne. Our thanks to Matt Hopcraft and Caroline Kaur for making this wonderful advance happen. It was only 8 months ago that thed3group.org reached 4 million hits and now the 5 million hits milestone has flown by. It's notable that, besides steadily increasing traffic (now averaging about 350 visits/day), overseas countries account for a growing share. Indeed, after publication of the D3-themed editorial in JADA, most visits arose in the USA during May. Now widely known as 'Sam's storybook', our educational reader was originally titled "It's just one of those things Sam. A kids' guide to Molar Hypomin". In referencing a famous song by Cole Porter, this title was intended to put a "positive coping" spin on the subject and included our public-friendly contraction of Molar Hypomineralisation introduced in 2013 with the Chalky Teeth Campaign and thed3group.org. Since then, D3G's chalky teeth terminology has gained a strong foothold across the sector, academia included (1, 2). Hence the public can be guided intuitively from a colloquialism for teeth that look different ("chalky teeth") through to "early decay" or "chalky enamel spots" and "chalky molars" as the case may be. With supplies running low, we took the plunge and gave Sam's story a "chalky molar makeover". It was shocking to discover that, despite all the original efforts made to avoid genderising Sam and PJ (so kids can decide for themselves), a textual slip-up had occurred on one page – now fixed! D3G received valuable exposure at the Gordon Conference on Biomineralisation, a scientific "think tank" event held near Boston, USA. Widespread interest surrounded not only D3s (being biomineralisation anomalies) but also the Chalky Teeth Campaign as a role model for translational research and education. Our thanks to conference chairs Derk Joester and Janet Oldak for inviting Mike Hubbard to be a discussion leader at this influential event. At the International Association of Dental Research's congress in London, Mike Hubbard's keynote lecture "Molar Hypomineralisation research – past, present and future" seemed well-appreciated and various other interactions with researchers and companies raised exciting promise for internationalisation of our D3 movement. For example, the D3 family has been extended to Africa by Morenike Ukpong-Folayan who signed up with 4 fellow practitioner-researchers and connected us with her wonderful worldwide academic network. And after many fun years interacting with Stephen Haynes at GC Australasia, we're thrilled to have Mark Heiss and Gaurav Joshi from GC America on board now too. Featured article: Do remineralization products work with Molar Hypomin? In perhaps two thirds of children with Molar Hypomin their demarcated enamel opacities have smooth (intact) surfaces placing them at less risk of decay compared to severe cases with broken surface enamel. Asking "do the remineralisation therapies available for enamel caries also work on Molar Hypomin?" our Argentinian member Ana Biondi tested three fluoride products using laser fluorescence to track enamel hardening (see abstract here). A fuller report appears in our members' newsletter. Featured article: Genetic contributions to dental fluorosis susceptibility? Modern genetics can be mind-numbing not least with many human conditions (including fluorosis, caries, and Molar Hypomin) having recently discovered "genetic associations". Illustrating this issue, a Brazilian study involving US-based friend Alex Vieira has convincingly connected subtle genetic variations (i.e. "polymorphisms") in two enamel proteins with fluorosis susceptibility in children exposed to community water fluoridation (see abstract here). A fuller report appears in our members' newsletter. Aiming to build on USA exposure through the JADA editorial (below), and courtesy of an invitation from D3G member Kevin Donly and colleagues at the American Academy of Pediatric Dentistry (AAPD), D3G was represented at the AAPD annual meeting in Honolulu by Mike Hubbard. Besides tangible benefits (subscribers, storybooks), this was a great learning opportunity, both in hearing reactions from those who had read the JADA article and absorbing opinions from others encountering D3G for the first time. It appears a large upside remains for improving US awareness when compared with similar meetings "Down Under". Our thanks to AAPD Exec members for not only providing a "D3G table" but also visiting it, and to Harleen Kumar and several other D3G members for support. has been pleasing at many levels as will be elaborated in future news items. With over 100 subscribers on board plus surging interest in the Chalky Teeth Campaign (CTC), several website updates were made recently. Foremost the earlier CTC "landing page" was expanded to a standalone CTC website aiming to better serve the public's immediate needs and enable future projects. This site can now be thought of as a funnel that captures interest (questions) from multiple avenues, provides initial answers, and then steers those requiring further information to appropriate sections of our "D3 encyclopedia". The next goal in this "standardised learning" approach is to establish a peripheral ring of "CTC satellite sites" as illustrated by the fledgling We Fight Chalky Teeth practice network). Similarly, the new "D3 world map" of paid-up members aims to strengthen social impact externally and also to help internally through "visibility driven" network growth. 1-in-12 kids have "Hypomin Es"
Following the March update for hypomineralised 6-year molars ("hypomin 6s"), equivalent data were compiled for hypomineralised "2-year molars" ("hypomin Es") aiming to bolster D3G's public health message that all molars are at risk of Molar Hypomin. The new bar graph shows average prevalence is 8% across 12 studies from 9 countries (vs 15% for 6s). These studies agree with historical findings and prompt a generalisation that Hypomin Es are half as common as Hypomin 6s. This information holds significance (1) for "early childhood caries" and tooth decay risk in "baby teeth", (2) for predicting risk of Hypomin 6s, and (3) for untangling the mysterious causes of Molar Hypomin. A fuller analysis appears in our members' newsletter. Following launch in October 2017, D3G's individual membership offering has steadily attracted subscribers from around the world. A pleasing milestone was reached in April with Ben Ganss (University of Toronto, Canada) becoming our 100th paid-up member. Given the research mission of D3G, it's rewarding that we already know "Professor Ben" as a widely respected scientist who has researched enamel for many years. A fuller article appears in our members' newsletter. Thanks to Sharon Dunn our long-serving graphic designer, D3G now has a smart infographic portraying "key numbers" associated with our goals and activities (see here). Importantly, reflecting our philanthropic origins and humanistic mission, D3G strives to do good for the world through our unique blend of translational research, education and advocacy. In other words, we aim to create "social impact" by targetting the public, the healthcare sector, and the medico-dental research community. When reflecting on the efforts put in and seeking funds to do great new things, it's important to be able to quantify impacts already made across the target groups. Before now, we've used a text-based "brag sheet" to relay our progress – this remains a good backup to the infographic for those wanting a bit more explanation. We used the slogan "1-in-6 kids have hypomineralised 6-year molars" to launch our Chalky Teeth Campaign in 2013 (see media release) – this referenced an average prevalence of 16% across the 42 studies then depicted on our "world map of Molar Hypomin". In 2015, the average prevalence across 59 studies stood unchanged at 16%. And now, a further 20 studies on, the average remains almost the same at 15%. This latest update includes 4 new countries (giving 36 in total), amongst which Mexico stands out as a neighbour to the USA which perplexingly still lacks any prevalence data. Regards variations between studies, our updated "bar graph" reveals little change with the range extending from 2% to 44% and most action still happening between 6% and 22% prevalence. A fuller analysis appears in our members' newsletter. The 8-year-follow-up to Peter Arrow's benchmark DDE study of Western Australian schoolchildren provides a rare longitudinal perspective on their dental and emotional burdens. Regards Molar Hypomin, caries risk was found to parallel the number of affected 6s and to also be higher in those who'd previously had decayed primary teeth read (see abstract here). A fuller report appears in our members' newsletter. A diagnostic system that accurately predicts the lifecourse of demarcated opacities, the defining pathology of Molar Hypomin, would be revolutionary. Melbourne PhD student, Karla Gambetta-Tessini, took a step towards this lofty goal by comparing the results of two imaging systems, QLF and microCT, in laboratory conditions (see abstract here). A fuller report appears in our members' newsletter. Hosted by ADA-Victoria, Mike Hubbard presented a "chalky teeth" lecture during the continuing education program at ADX18, the southern hemisphere's biggest dental tradeshow (over 140 companies represented). This well-attended event in Sydney's brand new convention centre provided much useful networking opportunity for D3G. Our thanks to ADA-Victoria and ADX18 for this opportunity and their generous donations. Following recent tradition (see November 2015 and March 2017), ANZSPD again kindly shouted a "D3G table" at their biannual congress on Queensland's Gold Coast. This networking opportunity was much appreciated as it prompted helpful feedback about emerging and ongoing projects plus allied funding quests. And many new subscribers signed up making our new membership map look much busier! Following from ADA-NSWs continuing education event last August (see news), Abby Corrigal kindly travelled from Sydney to join Matt Hopcraft and Caroline Kaur (ADA Victoria) and Mike Hubbard to discuss ways to promote the Chalky Teeth Campaign across ADA's membership and the public. Broadening D3G's exposure in continuing-education events, including at the forthcoming dental tradeshow in Sydney, was one of several plans hatched. Our thanks to ADA-NSW and ADA-NSW for this pleasing engagement. Just 10 months since the last "million hit milestone", December has seen D3G's online-education resource pass 4 million hits, reflecting over 250,000 visits and 800,000 page reads since launch in August 2013. Traffic now averages over 300 visits/day, and also continues to build at our public-facing site, the Chalky Teeth Campaign, with a noticeable increase evident since the 'We Fight Chalky Teeth' practice initiative was launched. By these measures at least, D3G is achieving a significant level of social impact around the world. Disentangling enamel defects from childhood caries is a "clinical snake pit", yet postgrad student Marilyn Owen and colleagues jumped right in with a well-designed study of Melbourne preschoolers. In their high-socioeconomic population, 1-in-7 children had hypomineralised 2-year molars (HM-Es), a third of which were affected severely. Severe HM-E cases generally had multiple teeth affected by relatively large, yellow-brown opacities and although statistics were hampered by low caries prevalence (only 13% of children had dentinal cavities), a significant association was found between opacity size and caries severity in HM-Es. The surprising finding that HM-Es had little impact on overall caries prevalence matches recent reports for 6-year molars in low-caries populations (read more here). Failure of resin bonding to hypomineralised enamel remains a common clinical complaint. Previous studies have shown that hypomin enamel contains more protein than normal and that chemical pretreatment with hypochlorite bleach improves its resin-bond strength. Realising potential safety benefits over hypochlorite, Mani Ekambaram and colleagues tested a natural protein-degrading enzyme gel and found it to be equally effective as hypochlorite on hypomin enamel, increasing bond strengths to about 90% of the normal-enamel level. Given that the enzyme gel has previously been recommended for removal of carious dentine, further investigation of its utility for hypomin teeth appears worthwhile (read more here). A chance "social bump" into a D3-savvy manager from Pacific Smiles Group led to a "chalky teeth" lecture from Mike Hubbard at their swish clinical centre in downtown Melbourne. This was a great instance of reciprocal education and left Mike much better versed in the benefits and challenges of corporatised dentistry. Our thanks to Caroline Townsend and Walter Reid for this opportunity and to PSG for their generous donation. We're pleased to introduce Rami Farah as our ambassador in the Middle East. Rami joined D3G while doing his paediatric dentistry specialisation and PhD in New Zealand and continues to contribute actively. His postgrad research focussed on biochemical and biomechanic aspects of Molar Hypomin, leading to several publications. Rami's recent clinical experience in Saudi Arabia has not only heightened his awareness of how badly Molar Hypomin can affect children and their families, but also exposed patchy awareness of this problem amongst some international peers. Accordingly, he now intends to recruit other 'D3 cognoscenti' to help him foster D3-family growth across the Middle East. Being hosted in Latin America, the IAPD congress was an ideal opportunity to gather support for translating 'Sam's story' into Spanish. Tempted by a flyer (see here) and mock book cover in Spanish, delegates from numerous Spanish-speaking countries offered to help with fundraising, translation and distribution. Requests were made for other languages too, so hopefully Sam's story can grow to become both a useful educational tool around the world and a serious fundraiser for D3G's research ambitions. Thanks to Vidal Perez and colleagues for the Spanish translation work and their willingness to help coordinate this important venture. IAPD's world congress on paediatric dentistry was a wonderful event, both in itself and for exposure of D3G. Molar Hypomin received unprecedented attention in the lecture halls – that is, two 2-hour sessions back to back and both jam-packed with about 600 delegates. Vidal Perez and Mike Hubbard each presented scientifically-flavoured talks, and translational research was the focus of another talk given by Mike. Subsequent discussions led to many pleasing advances including pledges for further collaboration with IAPD's exec, new members from across the globe, support for the "Spanish Sam" storybook translation initiative, and many other offers of help. The new "I love D3G" membership badges were snapped up, and the promotions team (wearing matching 'I love D3G' T-shirts) were kept busy providing information, signing up members and selling Sam's storybook. Some photos from this event are here. With the 'D3 family' now enriched with healthcare professionals wanting "continuing education" (CE, or CPD), it was timely to start a CE program as part of D3G's individual membership scheme (below). D3G is uniquely positioned to offer CE that is both D3-centric and scientifically robust, being founded by a scientist and having a comprehensive online-education resource on tap. An experimental "D3 snack" concept, involving short learn+test modules that can quite literally be completed during a 15-minute office break, is now being consumer-tested. Moreover, an updated format for the D3G Dispatch newsletter includes various "academic" elements (quiz, literature mini-reviews, latest D3 publications) to complement this advance. Following successful introduction of basic email membership (see here), an individual membership subscription to D3G was launched at the IAPD congress. This subscription package offers globally-unique educational and scientific information about D3s through a regular e-newsletter ('D3G Dispatch'), an hour of D3-flavoured continuing education, discounted entry to D3G events, and a membership pin on our 'D3 family map'. We're thrilled to now have our first international subscribers on board, representing a dozen countries. As part of our International Friends initiative (see here), we're proud to name Vidal Perez (University of Talca, Chile) as D3G's first international ambassador. Deeply aware of the Molar Hypomin problem in South America, Vidal came to Melbourne to do a translationally-crafted PhD with Mike Hubbard's group. His work led to a research award, a breakthrough publication about D3G, and several other forthcoming papers. Now back in his homeland, Vidal intends to foster D3 family growth across Latin America. Supported by GC Australasia and fronted by Philippa Sawyer and David Manton (all D3 family members), ADA-NSW ran a day-long seminar about Molar Hypomineralisation at their wonderful CPD centre in Sydney. D3G is most grateful to have received a donation from the proceeds of this event. In another world-first for D3G, and after February saw the pilot "We Fight Chalky Teeth" co-branded practice go online in Tasmania (see here), three more practices have joined in to create a budding network of D3-championing practices. And to enrich public-friendliness, we created a new "chalky molar"-inspired logo and tagline ("Champions in the fight against chalky teeth") for the Campaign landing site – thanks to Sharon Dunn for the cool design work. It is hoped this initiative will improve public and professional awareness of D3s, facilitate access to D3G educational materials, and provide financial support for D3 research and education. Read more here. Now back practising in Chile, Melbourne PhD graduate Vidal Perez reports a novel approach to improving the robustness of GIC restorations in severely hypomineralised molars. After filling the tooth with GIC, an orthodontic band was fitted as a strong metallic casing. Orthodontic bands are thought to be less harmful on gums when compared with stainless steel crowns (a commonly used approach). After 18 months observation, the gums were in good condition and the restoration remained essentially intact – something that would normally be unexpected for a GIC filling of that size. It will be interesting to see if these findings hold up beyond the single case reported (read more here). Delving deeper into the attractive but (so-far) vexed proposition of using low viscosity resin to harden hypomineralised enamel, Melbourne postgraduate student Harleen Kumar asked whether reliability of resin infiltration could be improved by removal of the surface enamel layer. Using polarised light microscopy, the surface layer was found to vary widely in thickness and its removal by acid etching was also variable. With subsequent resin penetration remaining unreliable (i.e. some success in about half of lesions studied) and adding little if any hardness, it was concluded that this approach cannot be recommended as a clinical procedure currently (read more here). Unfortunately, due to unforeseen circumstances, the scientific networking meeting and gala fundraiser events have been postponed. We will advertise the new arrangements as soon as possible. This month's publication of the first academic report about D3G's approach to the Molar Hypomin problem (free download here) constitutes an important milestone, not just for D3G but hopefully for the field and ultimately child health too. Until now, translational channels (websites, lectures, mass media) have been used to report D3G's advances and obtain valuable feedback from across the sector. This departure from tradition was driven by necessity, reflecting academia's generally weak grasp on Molar Hypomin and the need for translational approaches to fix it. Stemming from a "call to arms for enamel researchers" (see here), this article seeks to rally broader research attention around Molar Hypomin which is outlined translationally for the first time as a 3-level problem. Translational terms and several other "D3-isms" developed in collaboration with the D3G community are introduced to the academic literature for the first time. It's also noteworthy that the D3G website is used heavily for referencing, aiming translationally to assist non-academic readers. 'D3G Dispatch' – a newsletter at last!! Strong families depend on great communication – therefore a priority for 2017 has been putting mechanisms in place for this and related matters to happen effectively. So, with communications and membership foundations in place (see here and here), Sharon has turned to crafting a newsletter that is translationally suited for our broad variety of members. The first issue of "D3G Dispatch" has been....umm....dispatched to Joined Up members in a trial two-device format (i.e. quick read on mobile, and longer PDF version for tablet/print). Once we've caught up on the major backlog of news and achievements, we plan to add educational items about D3 research as a stepping stone to future "Continuing Education" offerings. An article arising from last year's International Symposium on Enamel (see here), which recommends priorities and directions for future research in the enamel field, emphasises both the need for stronger research efforts into Molar Hypomin and the allied translational opportunities offered by D3G. Furthermore, D3G is held up as a pioneering model for translation that could be adapted to other problem areas. A free download of this article is available here (disclosure: Mike Hubbard is a totally biased senior author). We're really happy that the "D3 brand" draws numerous compliments from many directions and so we're keen to continue developing it – as always, tips and suggestions are welcomed from all our stakeholders. Most obviously, Sharon has designed a chalky-molar logo for the Chalky Teeth Campaign and also adapted it for the We fight chalky teeth practices network where "Toothy" was employed as flagwaver for the new tagline "Champions in the fight against chalky teeth". The "love D3G" concept was also picked up for D3G membership and "Toothy" was used to inspire people to gift memberships ("pay it forward") to others in less-fortunate circumstances. And eagle-eyes may have noticed that Sharon recently renovated the D3G logo, aiming to increase its public appeal. D3G is honoured to receive endorsement from the International Federation of Dental Hygienists which represents over 82,000 members worldwide – many of whom serve at the frontline for detecting D3s in children. IFDH joins the International Association of Paediatric Dentists as our second world-peak endorser and we hope that the complementarity between these two organisations (from D3 perspective) can be harnessed to advance appreciation of D3 issues and D3G's efforts worldwide. We thank President Robyn Watson for prioritising this key endorsement. While paediatric dentists undoubtedly play a crucial role in the D3 field and so have dominated academic and clinical thinking, we felt it was time to better acknowledge the key parts played by other areas of the dental sector. So, alongside David Manton (a paediatric dentist and D3G's founding co-director), we're now proud to welcome Paul Schneider (orthodontist and co-founder of MRUFD) and Julie Satur (dental therapist/hygienist) as lead academic clinicians for D3G. We encourage people from these disciplines to share their "D3 thoughts and wishes" with our clinical leads. With the wonderful expansion of our D3 family to include International Friends came the need to rebadge our Antipodean core as "the hub" of a global effort. And with Australia and New Zealand known by many as "the land Down Under", what could be better for this purpose than "D3G Down Under"? Well perhaps something that doesn't attract the standard jokes about "down underwear?" and "downunder in the mouth? "...but that's something we're prepared to work around! Long-term international interest in D3G plus the wonderful reception Mike Hubbard received overseas recently (see here, here and here) has spurred the introduction of an International Friends subgroup and membership entitlement. At launch, 22 countries are represented by 60 friends comprising scientists, dentists, company folk plus a D3-affected family. This expansion brings with it the exciting opportunity to start thinking about what we might accomplish together as a broader collective, and also to ask what is needed to get there? Accordingly, to generate a more-globalised perspective about how best our D3 community can develop, we've added a public "Suggestions Board" to collect ideas and wishes from around the world. Two of D3G's supporting companies kindly waved D3G's flag at Australian Dental Congress, the biennial mega-meeting for Australian dentists held this year in Melbourne. As part of their promotion of a filling material often used on Hypomin teeth, GC advertised their association with D3G and generously donated us a slice of that month's sales. And aiming to encourage broader uptake across general dentistry, Colgate purchased 100 Sam storybooks and distributed them from their stand. We thank GC and Colgate for these family-spirited initiatives. With an "eShop" now available (see here), the next step in our self-sustainability agenda was to upgrade from regular emails to an efficient communications system. Sharon has worked her design magic in establishing a Join D3G portal that includes a "Pay-it-Forward" option for those socially driven types wanting to Share D3 Love. For starters, we've opened an "Almost-Free Basic Membership" category to cover simple email communications and get a regular newsletter underway – once the newsletter and other value-add features are in place, we intend to offer higher levels of membership by subscription. Although D3G membership has been free up till now, the time has come to move from reliance on charity into cost-recovery mode. And to help existing users adapt to this change, we've started with a very low bar – just A$5 to cover the external cost of our new communications system. With the Chalky Teeth Campaign landing site (see here) now attracting strong traffic and new endorsements, we felt it was time to merge this "public entry point" with the main D3G website more seamlessly. Hence, the latter has been given a makeover by introducing the public-friendly "chalky terms" (chalky teeth, chalky molars, chalky enamel spots) into appropriate areas of the KIDS and FAMILY sections. Most importantly, the new "What are chalky teeth?" page explains that, in having no fixed meaning, this colloquialism is a translationally useful device for starting conversations with the public before leading them into more explicit professional terminology. We are thrilled that AAPD, the Australasian peak body for specialist paediatric dentists, has come on board as financial supporters of the Chalky Teeth Campaign. AAPD endorsed D3G's website at launch in 2013 and many of its members have since made invaluable in-kind contributions to our ongoing activities. We look forward to furthering our collaborative efforts "towards better understanding and care of people with D3s". Presidents Philippa Sawyer and Bernadette Drummond are thanked sincerely for making this important step happen. Kicking off our self-sustainability agenda, new project manager Sharon Dunn (see here) has added a customised e-commerce facility ("eShop") into the D3G website. Initial offerings are Sam's storybook (separately targeting families and practitioners), D3G referral cards and a forthcoming basic membership. Early indications are that this long-awaited facility will be a win-win for customers and D3G operations. Stopping over in Auckland on his way back from IADR, Mike Hubbard was pleased to wave D3G's flag amongst the wide range of child-centric practitioners and company folk at ANZSPD's RK Hall lecture meeting. Many helpful discussions were had and lots of D3G materials distributed. Thanks to Marilyn Owen for representing the We Fight Chalky Teeth practice initiative (see here) and to ANZSPD president Tim Johnston for sponsoring D3G's table. Spurred by burgeoning interest in internationalising D3G plus a timely gathering of researchers (IADR General Session), our first offshore network meeting was held on Friday 24th March at an Irish pub in San Francisco. Over a scrummy pub lunch, the launch of overseas membership in D3G ("International friends of D3G") was toasted and ideas exchanged about what should come next. Read more here. Encouraged by positivity received from researchers during his overseas trip last year (see here and here), Mike Hubbard followed up with a much broader audience attending IADR's General Session. Numerous discussions were had with researchers, journal editors and company folk, leading to a more rounded impression of how best D3G might serve a broader international audience. Mike also gave a lecture on "chalky teeth" lecture and a research seminar at UCSF's School of Dentistry, hosted by enamel scientist colleague Pamela Den Besten. Already famous as D3G's website designer and illustrator of Sam's storybook, Sharon Dunn has stepped up to a broader project management and secretarial role. Until now, D3G's founder Mike Hubbard has been running the show almost single-handedly "after hours". However, with workload blossoming beyond his and other volunteers' capacity to deliver, a steady pair of helping hands has become essential. Generously, Sharon is working at a discounted rate to "give D3G a helping hand" – but as primary breadwinner and with a young child, she does need to be paid. It is hoped that by putting Sharon's design skills to good effect across various revenue-generating opportunities, her position will soon become self-supporting. Following their 2015 endorsement of D3G (see here), Australia's peak body for dental hygienists (Dental Hygienists' Association of Australia) has kindly "upgraded" to become financial supporters of the Chalky Teeth Campaign. We thank DHAA and President Melanie Hayes for their keen interest and support, and look forward to working together to increase D3 awareness. The "three million hits" milestone was passed in February, reflecting interest from around the world. Usage continues to climb (now averaging 250 visits per day) and Sam's storybook has been downloaded over 5,200 times. Most traffic comes from Australia, USA and UK but with many other countries not far behind it appears D3G's impact is spreading. In another world-first for D3G, February saw the first "We Fight Chalky Teeth" co-branded practice go online at Tassie Kids Dental. With so many practitioners praising the D3G website, an obvious next-step was to connect the Chalky Teeth Campaign (CTC) with practice websites via a CTC satellite page. And because "the fight against tooth decay" slogan enjoys universal recognition, we thought it logical to extend a "battle" metaphor to the world of chalky teeth (thanks to Garry Nervo for this idea). Hence "We Fight Chalky Teeth" was born as an informative and self-explanatory catchphrase for dental practitioners concerned about state-of-the-art management of D3s. This in turn led to a new logo for the practice homepage and stationery. It is hoped that, by bringing in other D3G supporters, a broadly beneficial network of D3-savvy practices can be established. Following up on bonding with the AI (amelogenesis imperfecta) community at last November's Enamel symposium (see here), D3G's Mike Hubbard was honoured to host Susan Parekh (Kings College, London) when she visited Melbourne this month. Besides her longstanding role in managing AI cases from across the UK, Susan is highly aware about Molar Hypomin and D3G's efforts to engage translationally across the sector. Discussions ended with the hope firstly that Susan could work with other D3-savvy colleagues to improve D3G's visibility in the UK, and secondly that D3G could increase its engagement with the AI community globally. On the back of his trip to the Enamel 9 Symposium, Mike Hubbard visited several "key opinion leaders" to gauge international interest in growing D3G beyond its current Australia+NZ scope. Discussions were had in the USA (Rebecca Slayton, Wendy Cheney, Colgate), UK (Nicola Innes, Mike Harrison, Susan Parekh) and France (Sylvie Babajko, Ariane Berdal), and D3G-centric lectures delivered in Boston, London and Paris. Opinions were overwhelmingly positive and while resourcing struggles remained the elephant in the room, it was felt that further internationalisation would be helpful in this regard. D3G was strongly represented at the 9th International Symposium on Tooth Enamel held this month in Harrogate, England. Vidal Perez presented biochemical findings from his PhD, attracting much interest in an overlooked aspect of enamel hardening. And in an enamel pathology session he chaired, Mike Hubbard rounded out several talks about Molar Hypomin by overviewing D3G's translational efforts and making a "call to arms" for enamel researchers – surprisingly, unlike amelogenesis imperfecta and dental fluorosis, Molar Hypomin has attracted little attention from enamel scientists before now. The subsequent discussion session went way overtime, and conversations continued for the remainder of the meeting. D3G was also involved in a workshop considering an international network for enamel geneticists. Those discussions brought us one step closer to the foundational hope that D3G could serve an umbrella role for interfacing various D3s with the public and politicians. D3G has won a grant from NZDA's Waikato Bay of Plenty branch to provide educational materials for dental professionals and affected families in their region. Fronted by D3G's local representative, Katie Ayers, the grant enabled supply of 500 educational packages (comprising Sam's storybook, website referral cards, GC patient brochures and Colgate kiddie stickers). We thank GC and Colgate for supporting this initiative, and NZDA-WBOP for handling the local distribution. We're thrilled to have the Australian Dental Student Association join their NZ counterparts (see here) as endorsers of D3G. Naturally it is hoped that the next generation of dental professionals have a better understanding of D3 issues than their predecessors – we look forward to working collaboratively with ADSA towards this goal. We thank the ADSA president Cheryl Chen, past presidents (Mohit Tolani, Audrey Irish), Velanni Martins and several other members of ADSA for supporting the various steps that led this endorsement. Following successful uptake of both the new "family-friendly" website referral cards (see here), and the Chalky Teeth Campaign landing site (see here) we decided it was time to merge these two advances. So D3G's referral cards now list both website addresses, letting families be directed to the chalky teeth site, and from there onto appropriate parts of the main website. The new cards are available from the secretary. Addressing caries risk associated with D3s in the primary dentition, Kim Seow and colleagues from Queensland recently reported a ground-breaking longitudinal study that followed children from birth through to 6-years old. Enamel hypoplasia and severe Molar Hypomin (yellow/brown opacities undergoing surface breakdown) were associated with 4.5 to 6-fold higher incidence of caries. About 10% of 725 children studied had at least one tooth affected by D3 and their caries developed much earlier than in teeth lacking D3s (read more here). These findings strengthen the evidential base for our Chalky Teeth Campaign. At invitation of the conference organisers, director Mike Hubbard lectured on "the chalky teeth problem" at the Australian Dental Students Association's annual convention, held this year in Melbourne. Beyond the formal opportunity to put D3G's spin on things, it was wonderful to discuss Molar Hypomin with many students and learn not just how patchy their understanding is, but also to get some insights as to why (e.g. some tutors denying or downplaying the problem). We thank the organisers and previous ADSA reps for their interest over the past couple of years that prompted this opportunity. Building on recent linkages with the public health sector (see here), director Mike Hubbard lectured at the Public Oral Health Innovations conference hosted in Melbourne by Dental Health Services Victoria. His talk, which discussed the Chalky Teeth Campaign as being a new educational system for patients and practitioners, is available online (video here). Winner of this year's Colgate-ANZSPD research award was Vidal Perez, a Chilean paediatric dentist studying for a PhD in Melbourne (see here). [August 2014] Competing against a variety of fabulous presentations, Vidal's engaging description of his biochemical investigations into the pathogenesis of chalky enamel won the day, helped perhaps by closing remarks expressing intent to spread his "Australasian D3 family" experiences across Latin America. Vidal graduated in December, with his thesis earning a commendation for the Chancellor's Prize at the University of Melbourne. Pictures here. After nearly 3 years operation without missing a beat, the D3G website hit a wall due to a technical "innovation" introduced by our service provider – simply put, a feature our site depended on was no longer supported. Rather than rework the website, we decided to change service providers. Our sincere thanks to our website guru Suzanne Thomson for dropping everything and sorting this all out in amazingly short time (down 25/11, back up 27/11). With the Chalky Teeth Campaign idea taking off, it was decided to develop a landing site of the same name as a public entry point to the main D3G website. The new site was launched by ANZSPD president John Sheahan at the society's recent conference in Adelaide. With its easily remembered address (www.chalkyteeth.org), summary of the problem, and streamlined links to topics of lay interest, we hope this site will become a focal point for public awareness raising. We thank the University of Melbourne for funding support (public engagement grant). After a career of standing on the customer side of the table at trade shows, the "table turned" for director Mike Hubbard at ANZSPD's biennial conference in Adelaide where for the first time D3G had a display table. On display were Sam's storybook, D3G referral cards and flyers about the websites and an upcoming D3G supporting practice initiative, plus the compulsory clipboard for registrations of interest. A busy time was had, with Mike's PR efforts kindly supported by Vidal Perez and Elissa McElroy. The organising committee is thanked for hosting D3G's display at no charge. Honouring Grace Suckling's remarkable life, D3G was proud to launch an online tribute that puts her research into a translational context. Drawing on material assembled for the 2013 event where Grace became our founding patron (see here), this new page presents both a listing of her research publications and a categorical recompilation that highlights the wide-reaching nature of her work – across lab, clinic and populations. A full-length version of Grace's interview with Erin Mahoney is also now available. D3G respectfully acknowledges the passing of Elizabeth Waters (University of Melbourne), whose many interests in child health extended to providing guidance for our Chalky Teeth Campaign. 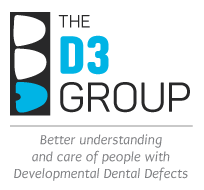 Following their 2013 endorsement of D3G (see here), Australia's peak body for child-centric dental professionals (Australian and NZ Society of Paediatric Dentistry) has kindly "upgraded" to become financial supporters of the Chalky Teeth Campaign. We thank ANZSPD and President John Sheahan for their keen interest and support, and look forward to working together to increase D3 awareness. We are grateful to ADOHTA for distributing D3G website referral cards and flyers to delegates at their 50th anniversary congress held recently in Melbourne. After a remarkable life spanning 93 years, Grace Webster Suckling (b. 22/1/22) passed away on July 20th in Waikanae (near Wellington, NZ). Trained as a dentist in Dundee, Scotland, Grace practised in the UK before moving to NZ in 1956. After raising her family, she joined the Dental Research Unit in Wellington and, at the age of 50, started researching developmental defects of enamel (DDE) in sheep. A stunning 29 research papers later, she had not only spawned the DDE index but also produced what remains today an unsurpassed and rock-solid contribution to terminology, diagnosis and aetiology (i.e. DDE epidemiology and pathogenesis, enamel biophysics, fluorosis and tetracycline staining). In becoming our Patron (see August 2013, below), Grace was interviewed by D3G-NZ rep, Erin Mahoney (clips). We plan to bring the full interview, and other remembrances of Grace's fabulous and oft-overlooked gems, to this website shortly. From doyen of DDE to patron of D3G, thankyou, and rest in peace Grace Suckling. D3G's director Mike Hubbard was invited to present the Chalky Teeth message at a "scientific showcase" meeting in Canberra attended by the USA ambassador to Australia, John Berry. This golden opportunity, which originated from Mike's alumni status with the USA National Institutes of Health, was secured by the organisers interest in D3G as a groundbreaking example of a translational research network. Mike's talk played on the surprising lack of USA studies about Molar Hypomin and ensuing prospects for USA-Australasian partnerships in research and education. A pleasing level of positive feedback was received from both the official party and other presenters. Facing increasing workload and dwindling finances, several D3G members got together and organised a "Sam's helping hand" fundraiser in time for the end-of-financial-year giving period. We are grateful to our partner organisations (AAPD, ANZSPD, RACDS) for helping spread the word across their memberships, and of course to those who donated. Besides the usual participation by many D3G members, this year's biennial worldwide meeting of paediatric dentists features a D3-themed talk by Melbourne PhD candidate, Vidal Perez, and D3G promotional materials in delegate's bags (all 1,700 of them!). Vidal will outline how the "D3 family" has helped his molecular investigations into the pathology of "chalky enamel", and invite people to attend the next IAPD congress being held in his home country, Chile. Our thanks to ANZSPD, IAPD, and Vidal's travel sponsors for making this important exposure possible. We are grateful to ADSA for distributing D3G website referral cards and flyers to delegates at their annual congress held recently in Cairns. Teaming up with two MIH stalwarts, Melbourne academics Aghareed Ghanim and David Manton have admirably broached two troubling topics in the Hypomin field. First, the need for better standardisation of epidemiological studies (and allied aetiology) is argued, and a statistical basis for sample sizing offered. Second, standardised scoring and charting regimes are suggested, in essence being further adaptations of the DDE index that emanated from studies by our patron Grace Suckling ("atypical fillings/extraction", review). Although D3G offers a different perspective on several details, the general principles of these arguments clearly need to be heeded (read more here and here). Following the illustrious footsteps of Rami Farah, Otago postgraduate student Arun Natarajan applied a new approach to characterise the composition of Hypomin enamel. Teaming up with experts from Chemistry and Mathematics, Raman microscopy was used to chemically map "chalky" lesions, and then the effects of different resin infiltration procedures were examined. Pretreatments (acid, protein removal) improved Hypomin enamel properties (in most cases) and resin penetration (in most cases). The exceptions, plus evidence that clinically similar "brown opacities" diverged at chemical level, offer multiple possibilities why a Melbourne group had found such resin treatments to be inconsistent (read more here and here). Having passed "one million hits" last November, www.thed3group.org has now reached a new milestone by hosting its 100,000th visitor. Usage continues to climb (now averaging 180 visits per day) and Sam's storybook has been downloaded 4,000 times. It appears D3G's impact is spreading, both in Australasia and beyond. With high demand following our recent Chalky Teeth promotion, ADOHTA has kindly agreed to distribute website referral cards to their members on behalf of D3G. This family-spirited move provides much-needed relief for the D3G secretariat. We thank ADOHTA president Hellene Platell for sanctioning this pioneering step. Thanks to sponsorship by the ANZSPD, all ADOHTA members will receive a glossy copy of Sam's storybook along with website referral cards and a sheet of the Colgate-D3G reward stickers. With therapists playing such a key role in identifying "Hypomin kids" and educating their families, this generous initiative from the paediatric dentistry community exemplifies the "family ethos" of D3G. We thank presidents John Sheahan (ANZSPD) and Hellene Platell (ADOHTA), and Colgate, for colloborating with D3G on this milestone project. Having received a glossy copy of the Sam book at the NZAO conference, orthodontist Betty Keng obtained a further 50 copies to give to school therapists in her region (Taranaki). On hearing this fabulous example of "D3 family spirit", two other orthodontists (Mark Ewing, Sax Dearing) did the same thing for their respective regions (Waikato, Hawkes Bay). We thank Betty, Mark and Sax for pioneering this wonderful initiative, and for their allied donations to D3G. Building from a D3G-themed presentation by Nina Vasan in 2013, three D3G stalwarts (Erin Mahoney, Paul Schneider, Mike Hubbard) gave "world-first" interlinked talks about Molar Hypomin from paediatric dental, orthodontic and D3G+scientific aspects, respectively. And delegates were treated to a glossy copy of Sam's storybook thanks to sponsorship by NZAO. We were thrilled to find so many Kiwis clued-up about the orthodontic aspects of Hypomin and already using our website. Thanks to NZAO for providing this opportunity. GC's education+marketing brochure for Molar Hypomin families, developed collaboratively with D3G (see December 2013 news, below), is proving highly popular. Since GC's initial distribution of 8,000 copies across Australasian dental practices, a further 12,000 copies have been requested by practitioners (available through Henry Schein at no cost). The partner brochure for dental practitioners continues to be available online. The Chalky Teeth Campaign marches on, this time to Brisbane where 3,000 glossy copies of Sam's storybook will be distributed to delegates, along with the website referral card. D3G warmly thanks GC Australasia for sponsoring this promotion, and ADA for their support. Stemming from recent interactions with Victoria's public oral health provider (DHSV), Mike Hubbard was invited to talk about the Chalky Teeth problem at DHSV's regional health conference held in Wangaratta. Valuable feedback was obtained about the practical challenges faced by those at the coal-face in the public health sector. Australia's peak body for dental hygienists (Dental Hygienists' Association of Australia) has now joined the D3 family, complementing the presence of their therapist colleagues (ADOHTA). We thank DHAA for their endorsement and look forward to working together. Since airing the commemorative copy last August (see website launch report, under Events), the "glossy print" version of Sam's storybook has attracted praise as a valuable adjunct to the free digital versions, which can be viewed online or downloaded for printing. It appears we are not alone in enjoying the pleasure of holding (and smelling?) a real book, and flipping through its shiny pages. So, we are now making glossy print copies available in exchange for a donation to D3G (A$4 per copy plus delivery for bulk orders). Please email d3-sam@thed3group.org to order. Rami Farah, a longtime Molar Hypomin researcher and D3G supporter from New Zealand (see here) is now spreading D3G's message across the Middle East. This month Rami is delivering lectures about Molar Hypomin in Saudi Arabia (his new homebase) and Jordan, incorporating a video introduction about D3G from director Mike Hubbard. Thanks Rami – we are thrilled to see D3G's reach being extended in this way. The "one million hits" milestone was passed in November, reflecting steady usage that continues to climb (currently averaging 160 visits per day). All audience sections (KIDS, FAMILIES, COMMUNITY, PRACTITIONER, RESEARCHER) are being accessed strongly, suggesting a diverse user base. And Sam's storybook has now been downloaded more than 3,400 times. Clearly, with this amount and diversity of traffic in just over a year since launch, www.thed3group.org is helping many people around the world. Complementing a lecture by D3G co-director, David Manton, the South Australian & Northern Territories branch of ADOHTA kindly sponsored a copy of Sam's storybook for all delegates at their annual conference in Adelaide. This move caps a recent groundswell of interest in D3G by the therapist community, as evidenced by numerous requests for website referral cards and membership. D3G thanks ADOHTA-SANT for this pioneering step and the allied donation. Instigator and co-director of D3G, Mike Hubbard, was interviewed by Bite magazine's Chris Sheedy about his vision and experiences in establishing D3G as a translational research and education network. This new article relays how "the D3 family" approach is steadily overcoming a variety of longstanding barriers, complementing an earlier outline of Hubbard's thoughts about D3G. Naturally we all hope that the next generation of dental professionals have a better understanding of D3 issues than their predecessors. An added bonus of the 2014 Wrigley project was that the NZ Dental Students Association became endorsers of the D3G website initiative. We look forward to working collaboratively with NZDSA on future educational projects. For the second year running,D3G has won funding support from the Wrigley Company Foundation's Community Service Grants in Australia and NZ. This year's "Student Power" project took the Chalky Teeth campaign to dentistry and therapy students in both countries, providing them with a glossy copy of Sam's storybook, plus a sample of the new website referral cards and Colgate-D3G reward stickers. Our thanks to Marilyn Owen and Alejandra Hernandez (Oz) and Bernadette Drummond, Omar Alsabiry and Erin Mahoney (NZ) for fronting these projects, and the many other volunteers and dental school representatives that made this promotion possible. Having distributed 16,000 of the original "professional look" business cards, D3G decided it was time to better serve our main target audience. The new "family-friendly" card features the Sam and Toothy characters from www.thed3group.org. Our thanks to D3G designer, Sharon Dunn, for this colourful new addition to the D3 family, and to Julie Barker (President, ADOHTA) for suggesting it. The new cards are available by emailing secretary@thed3group.org. Vidal Perez, a Chilean paediatric dentist studying for PhD at the University of Melbourne, has returned from a 3-week tour of Uruguay, Brasil and his home country, delivering 9 lectures to diverse audiences (2 dental conferences, 2 paediatric dentistry societies, staff and postgraduates at 4 universities). Great interest was received in the general concept of research translation, as exemplified by D3G, as well as the specific translational approach used by Vidal to investigate the pathogenesis of Molar Hypomin. The tour culminated with a 20-minute interview televised by ChileGlobal, which took our D3 research+education message to an international Latin audience. Our thanks to Vidal's hosts and travel sponsors for making this important exposure possible. Early in the D3 project, several members said it would be nice for "Hypomin kids" to have their own "special reward" stickers and so this prospect was embedded in the website and Sam's storybook. Pleasingly, the "Colgate ladies" in Sydney agreed and suggested a design based on D3G's "Toothy Scientist" giving an oral hygiene message. This vision was brought to life by our graphic designer, Sharon Dunn, respecting the "rules" developed for educational+marketing brochures (i.e. avoiding exclusivity and D3G endorsement of particular products; see December 2013 news). We thank Susan Cartwright, Lenore Tuckerman and Sarah Raphael from Colgate for collaborating on this great addition to the D3 toolbox, and Colgate Australasia for sponsorship of a substantial print run. Further acknowledgement of the key role played by therapists in identifying "D3 children" has come from D3G's latest endorsement, the NZ Dental and Oral Health Therapists. We welcome NZDOHT to the D3 family and look forward to working together on shared educational interests. In a pioneering "D3-family effort", two educational brochures were developed collaboratively by GC and D3G this year. Targeting dental professionals and Molar Hypomin families respectively, this multilevel education+marketing campaign was designed to be a "4-way win" (i.e. benefiting families, practitioners, GC and D3G). To avoid any suggestion that D3G endorses GC products, both brochures clearly endorse D3G educational resources (rather than the other way round) and are being produced and distributed by GC. D3G hopes that, by making its educational content available non-exclusively to companies and other "distributors", a consistent message will be relayed to the public, politicians and healthcare professions alike. We thank Stephen Haynes and Alexandra Sbaraini at GC for helping develop suitable "rules of engagement" and then producing documents that honour the "look and feel" of D3G. Independent contributions from several D3G members are also acknowledged. D3G was thrilled to receive endorsement from the International Association of Paediatric Dentists, which represents over 15,000 members from 59 children's dentistry societies worldwide. D3G members have played leadership roles in IAPD over many years, including hosting the 2005 Congress in Sydney. We salute their contributions for engendering global respect of D3G's social mission, and particularly thank IAPD President Eduardo Alcaino for prioritising this key endorsement. Hot on the heels of their trans-Tasman colleagues, the NZ Association of Orthodontists has kindly added their endorsement of D3G's educational website and Chalky Teeth campaign. Welcome to the D3 family NZAO. Better recognition of the intricate interrelationships between Molar Hypomin and orthodontics is a central plank of D3Gs educational mission. Consequently, D3G was pleased to have the Australian Orthodontic Society endorse its website initiative. We look forward to working collaboratively with ASO on research and educational areas holding mutual advantage. Recognising the crucial "early detection" role that dental and oral health therapists play with D3s in children and adolescents, D3G was honoured to have their Australian peak body (ADOHTA) endorse our website initiative and offer collaborative assistance with ongoing developments (including kiddie stickers and family-friendly referral cards). We look forward to further interactions with this important branch of the dental healthcare family. D3G has won funding support from the Wrigley Company Foundation's Community Service Grants for its website rollout activities in Australia and NZ. Drawing on voluntary inputs from the large student membership in Melbourne, our ADAF-Wrigley project brings "student power" to the promotion and further development of D3G's educational resource. Likewise, the NZDA-Wrigley project will boost Kiwi awareness through distribution of promotional materials. Our thanks to Marilyn Owen and Daniel Cocker (Oz) and Erin Mahoney (NZ) for fronting these projects. A closely kept surprise for those attending the D3G launch event was news that research pioneer Grace Suckling has agreed to be D3G's patron. D3G co-director Mike Hubbard outlined how, as "doyen of the DDE era", Grace made huge contributions to the D3 field, including the first diagnostic index for "Developmental Defects of Enamel" (DDE index) and publication of 29 research papers spanning a remarkably broad range of science (e,g, epidemiology, pathogenesis, biophysics). Still going strong after 91 years, Grace was interviewed for the event by D3G-NZ rep, Erin Mahoney (video). Pursuing its translational mission, D3G plans to bring more of Grace's fabulous and oft-overlooked contributions to the forefront shortly. After more than 3 years' gestation, D3G's online education resource was finally launched officially by MRUFD benefactor Maria Myers. Adding excitement, paediatrician Sharon Goldfeld announced the intention of two Australasian Royal Colleges (Physicians, Dental Surgeons) to collaborate with D3G on preventive aspects of "D3-caries". And as icing on the cake, unfurling of our public-friendly "Chalky Teeth" campaign gained worldwide attention. For further information, see the three reports under Past Events. D3G was honoured to receive endorsement for its website initiative from the Royal Australasian College of Dental Surgeons. This liason is pleasing at multiple levels, noting RACD's interactions with RACP on child oral health (see news item below) and that many RACDS members have supported development of the D3G website. Also enticing is the collaborative interest expressed by RACDS in adding assessment capabilities to some sections of the website, with a view to boosting utility for practitioner education (cf. possibility of a terminology test). In 2012, the Royal Australasian College of Physicians (Paediatrics and Child Health Division) released a pioneering position statement about oral health in children and young people. Following input from D3G, the document has now been extended to cover D3s and associated risks including caries. The updated strategy document, which is supported by the Royal College of Dental Surgeons, can be downloaded from here or directly. This initial interaction with the RACP is a key milestone for D3G, particularly noting the all-important medical aspects of Molar Hypomin and ensuing prospects for involving medical and allied health practitioners in preventive interventions. Ahead of the official website launch in late August, D3G was honoured to receive endorsements from the national bodies for general dentistry in Australia and NZ: the Australian Dental Association and the NZ Dental Association. We view these connections as particularly important, noting the key role that dental GPs play in early detection of D3s and interception before "the rot" (caries) sets in. Following its pre-launch in April, the D3G website initiative was privileged to receive endorsements from both Australasian peak bodies for paediatric dentistry: the Australasian Academy of Paediatric Dentistry and the Australian and NZ Society of Paediatric Dentistry. With members of both organisations having made invaluable contributions during website development, we look forward to further collaborative activities. As acknowledged on the homepage, the Australasian branches of three multinational companies have become "supportive family members" of D3G by subscribing to D3G's cross-sector-family philosophy and donating generously towards the website rollout activities. Joining long-time supporters Dentsply and Colgate are GC Corporation and A-dec. Additionally, Acteon made a helpful donation towards costs of the launch function. We look forward to further collaborative efforts in education, research and advocacy, and welcome other companies to join the D3G family (for further info please contact D3G's Directors). Having treated members to several previews at D3G meetings, Felicity Crombie has now advanced to publishing three reports from her PhD investigations of Hypomin molars. Firstly, using a variety of lab tests (chemical and physical), she found that not only was Hypomin enamel strikingly different than normal, but also that its clinical appearance and physical properties weren't tightly correlated. (read more) This perplexing variability was echoed in two lab studies of treatment options, where resin infiltration was found to "work" in some cases but not others (read more) and treatment with caries-remineralising solution (CPP-ACFP) led to varied improvements in hardness of Hypomin enamel (read more). Like all good PhD projects, this one opens the door to many intriguing opportunities for follow-up research. After three years gestation, D3G's new website was unveiled to the dental community at annual meetings of specialist paediatric dentists (Australasian Academy of Paediatric Dentistry) and general practitioners (35th Australian Dental Congress).These events generated much positive feedback and a major surge in website traffic. For more information see the separate report above (under Events). In a remarkably productive PhD project, Aghareed Ghanim characterised many facets of Molar Hypomin in her home country, Iraq. Exploiting her experience as a paediatric dentist, Aghareed examined the second primary molars and permanent (adult) teeth in a large group of children from Mosul City. MIH was found to affect about 19% of permanent dentitions and 7% of second primary molars (read more here and here). Medical history analysis suggested causal associations with illness during infancy but no single factor was identified as a potential cause of MIH (read more here and here). Affected adult molars were found to have higher incidence of caries and to require at least twice as much restorative treatment as unaffected molars (read more here and here). In a prior survey of Iraqi dental academics, a vast majority reported they encountered MIH on a regular basis (read more). Using clinical proteomics, two D3G research teams have characterised Molar Hypomin lesions at protein level for the first time. Dunedin-based workers (Farah, Monk, Swain & Drummond) found that discoloured Molar Hypomin enamel had much higher amounts of protein than normal. Some of the proteins identified are typically associated with serum, leading the team to suggest a mechanism that could help explain the abnormal protein and mineral contents of Molar Hypomin enamel (read more). A multidisciplinary team from Melbourne (Mangum, Crombie, Kilpatrick, Manton & Hubbard) also found high protein contents and went on to show that lesions with intact surfaces contained different types of protein than those with broken surfaces. These findings enabled the team to discriminate serum-derived proteins from those originating in saliva, so leading to novel insights about the pathogenesis of Molar Hypomin (read more).